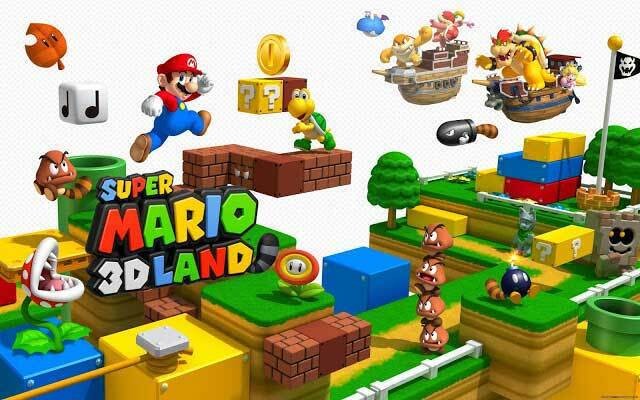 Super Mario 3D Land is a 3d platformer developed by Nintendo for the 3DS. A great storm hits the Mushroom Kingdom and blows Super Leaves everywhere. During this, Princess Peach is kidnapped by Bowser and is being held in his castle. It's up to Mario to rescue her. Mario games usually have a fairly minimalist story. 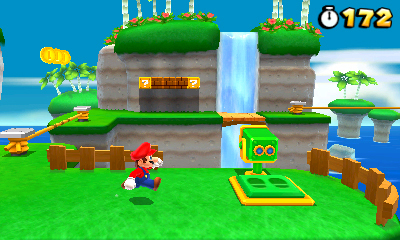 The 3D view is heavily utilized in this game as much of the platforming uses it. Even though you can play with the 3D mode off, it's not recommended as it makes the game harder. The game will tell you when there is a section that should be done with the 3d mode on by having a small icon display on the screen. It's strange to see the 3D feature being used as more than just a gimmick, but as a game play mechanic instead. Characters will fly towards your screen and look as if they have just come out of the DS, it's one of the few convincing 3d effects that I've seen. The game is fairly easy, I didn't struggle much throughout the levels and managed to finish them quickly. This doesn't mean that they aren't fun though, I really enjoyed them. The various clever uses of 3D adds a lot to the experience. The graphics look great for a 3ds game. Characters look as if they are really coming out of the screen and the game's mechanics use 3D features expertly which helps create one of the very few games that is significantly improved by the use of the DS's 3D screen. An issue I personally have with 3d games is that they can be very hard on the eyes because if you look away from the screen and look back, it can be difficult to readjust your eyes in order to see the image in 3d again. I surprisingly did not have this issue with Super Mario 3D Land. 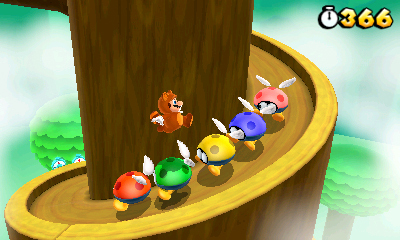 The sound quality is high and the sounds are all easily recognizable to people who have played other Mario games. Each character and effect sounds like it should and matches very well. Playing through the game again just to beat your last time or to collect every item in a stage can be a fun motivation to revisit this game. Verdict: 9/10 a brilliant game that never fails to entertain. My only issue with this game is that the 3D option is pretty much required and makes the game significantly harder if you need to disable it.